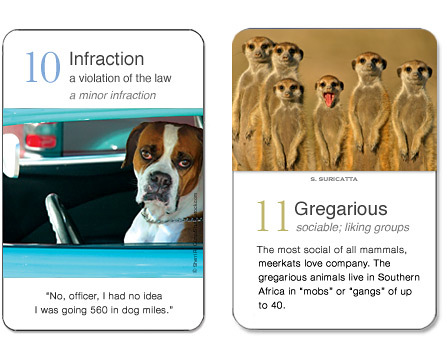 See why we call our flashcards "the world's most interesting way to learn words®"
Great stories. Our stories are unforgettable—and that's how they make words stick. Each "story" provides a clear context for the featured vocabulary word, so readers easily understand how the word is used. The vocabulary is closely associated with the memorable details, making learning words almost as easy as laughing at a funny caption, reading about an unusual animal, or getting the scoop on a cool city. Fantastic photographs. The images not only say "look at me," they match the meanings of the vocabulary they're paired with. Just looking at our pictures helps build familiarity with words. Visual learners have never had it so good! Perfect for the SSAT, ISEE, PSAT, and SAT. Our cards contain the same vocabulary words that are tested on the standardized exams given in middle school through high school. Appropriate for younger children. The simple stories and dramatic photographs hold the attention of younger readers, who will quickly get the idea that words can be fun. Children as young as six have liked our cards. It's easy to assess whether our cards are appropriate for your child. Click on any flash card set to view a complete vocabulary list of the words it contains. Unique gifts. Our cards are one-of-a-kind educational gifts for kids and teens. They also make great gifts for teachers. Lead-free and made in the USA. 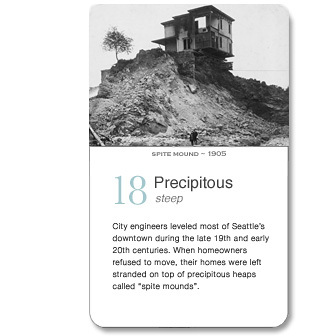 Printed in Seattle from high quality card stock, the cards contain no lead. 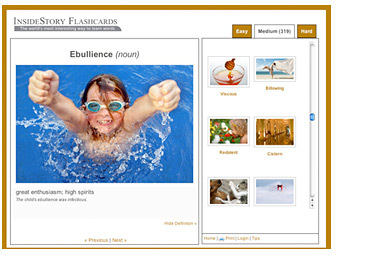 Free Printable Flash Cards - Our Vocabulary Builder has hundreds of vocabulary words with photographs for easy visual learning. Print out flashcards or improve your vocabulary online.